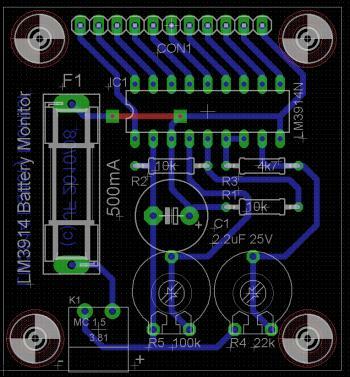 LM3914 Battery Monitor | Enide! 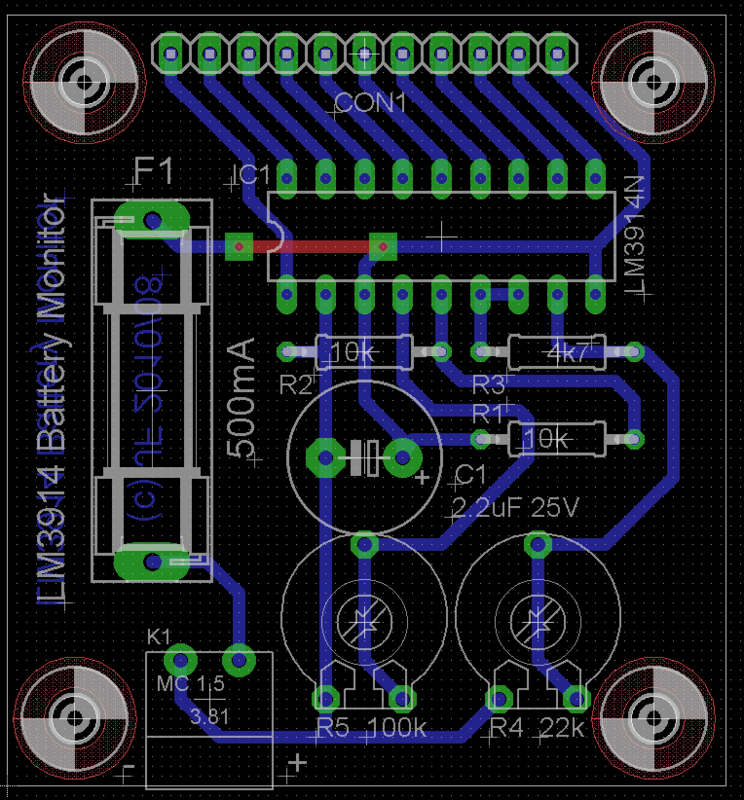 This is a bar-graph voltmeter for a 12V battery based on the well known LM3914 IC. I have a 12V car battery attached to a regular 500VA UPS and, because the UPS is old and doesn't have any management options, this is how I measure the amount of charge in the battery. It was developed mainly because it gives a nice look to the UPS, with its red, yellow and green leds. It is also easier to read than conventional digital or analog voltmeters. LEDs: To be visually attractive it needs a bar of leds with several colors. 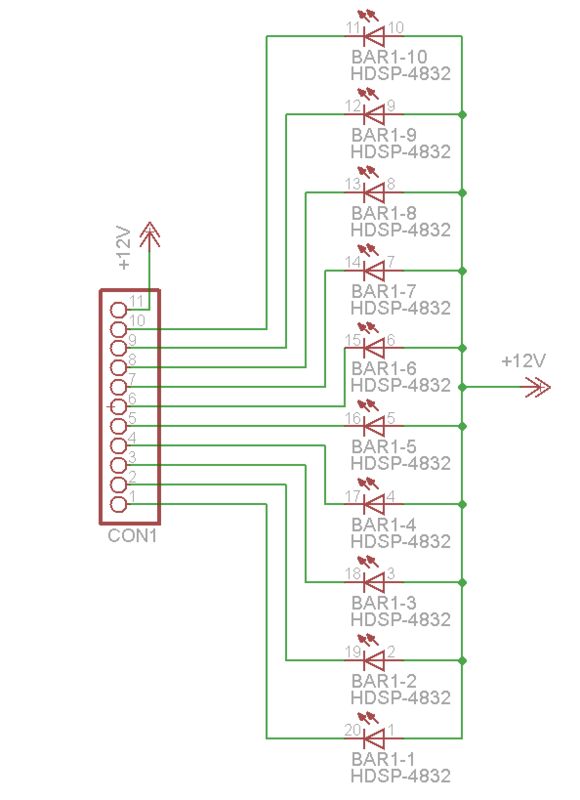 The HDSP-4832 is a led bar with 10 leds, 3 reds on one side, 3 greens on the other side and 4 yellow leds in-between. 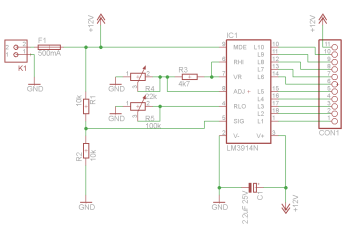 Power supply: The circuit needs to be powered from the battery being measured and to be able to adjust the lower and upper voltages that light the first and last leds on the led bar. For the 12V battery, the first led in the bar will lit at 10V and the last one at 13.5V, giving 0.35V per led. These thresholds may be set to other values by adjusting two trimmers in the circuit. These two adjustment points make the circuit flexible enough to use it for other purposes like measuring the charge in NiCd and NiMH batteries. The thresholds can be set to Vmin = 0.9 * Ncells and Vmax = 1.45 * Ncells and a power resistor has to be placed between the battery + and - terminals during the measurement. This resistor should draw at least 0.5A from the battery to simulate a real load. But this is just an idea. Led mode: The LM3914 can be configured to work in dot mode, with only one led is lit at a time, and in bar mode where it lights leds progressively when the voltage increases. The circuit works in bar mode to create a greater visual impact. Its pin 9 is connected to the positive supply to select this mode. 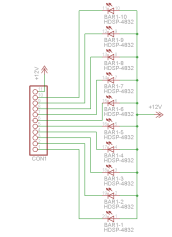 Bar mode increases current consumption on the LM3914. When all leds are lit, the LM3914 consumes 10 times more current than when it is in dot mode. 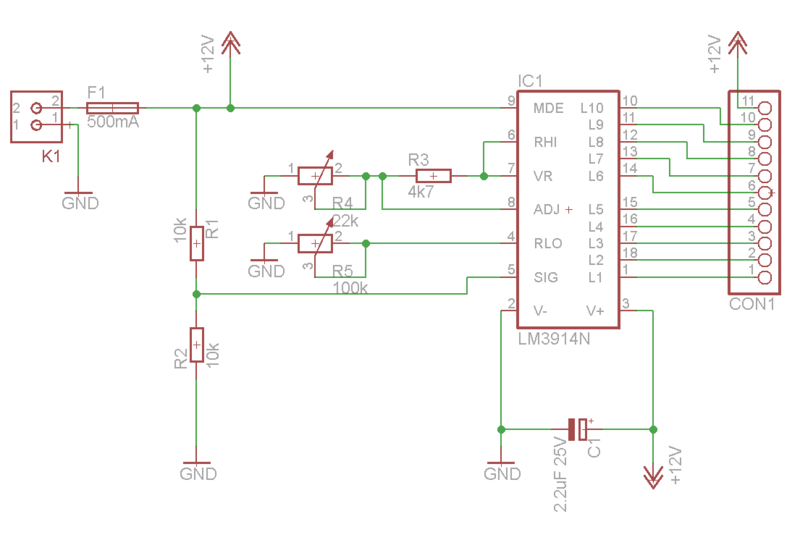 This means the individual led current will have to stay low to prevent the LM3914 from burning. Its maximum power dissipation should be kept under 1.365W and assuming the battery supply voltage will never go above 14.4V, the maximum current admissible is I = P/V = 1.365/14.4 = 94.8mA. With all 10 leds lit, their individual currents cannot be greater than 9.4mA. So a current of 2.6mA per led is small enough to keep the IC cool. The current is set by R3 = 4K7. The current per led is approximately 10 times the current flowing in this resistor, IR3 = 1.25 / 4700 = 266uA. The input stage: To be able to read the supply voltage from which the circuit is also powered, a 1:2 voltage divider was placed at the input pin 5. This voltage divider consists of two 10KΩ resistors and the LM3914 will read voltages that range from 5V to 6.75V, when the battery voltage swings from 10V to 13.5V. These are the values that will be used to calibrate the LM3914. The schematic is made of two circuits; the one on the left is the voltmeter with all the control resistors. The other on the right is the display panel with the led bar. They connect using a 11 pin SIL header. As stated in the design section, R3 = 4K7 thus limiting the current to 2.6mA. With the 22K trimmer we are able to change the voltage on pin 7 from 1.25V up to 9.74V which represents 2.5V up to 19.5V. Our required voltage of 6.75 falls well within this range. 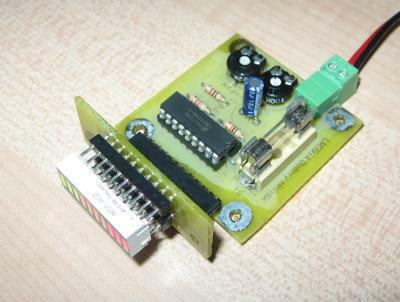 There are two PCBs, the main with all the components except the HDSP-4832 and the panel with the HDSP-4832. This enables you to place the panel anywhere you like or attached to the main PCB. After adjusting the voltage at R5's middle pin to 5V and the voltage at R4's middle pin to 6.75V, the circuit performed as expected, measuring voltages from 10V to 13.5V. The prototype photo is below. Voltages below 10V will turn off all leds and above 13.5V will maintain all leds lit.